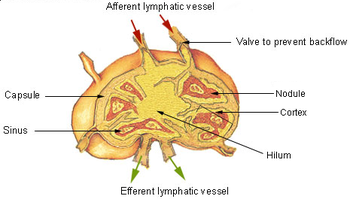 A Lymph node (IPA: [ lɪmf noʊd]) is an organ consisting of many types of cells, and is a part of the lymphatic system. Lymph nodes are found all through the body, and remove foreign (not of the body) objects from the body. Lymph nodes contain white blood cells. They are important for the correct use of the immune system. A diagram that shows where lymph nodes are found in the human body. In the human body, the most likely place where lymph nodes can be felt are the neck, underarms, and groin area. This page was last changed on 16 July 2013, at 13:37.